When the temperatures are hot, cool down at the Waterpark at the Monon Community Center in Carmel, Indiana – a 3.5 acre waterpark experience that’s sure to keep the kids entertained all day long. The Waterpark is much more than just a pool – though it does have a kiddie pool, an activity pool and a lap pool with six 25-meter lanes if you’re just looking to splash around or get some laps in. Slide into summer fun on the plunge slide or one of two adventure slides. Adventurous kids can tackle the AquaClimb wall, too. 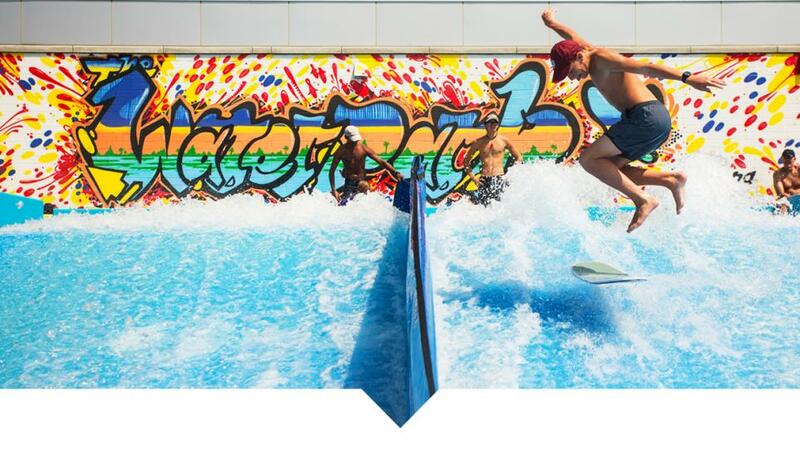 For those over 48” tall, try out the FlowRider simulated surfing experience. For those wanting to take it slow, float down the lazy river in an inner tube and soak up some rays – with sunscreen on, of course. Safety first. Private cabanas are also available for rent and can be reserved online. The Waterpark can get busy during the summer, and staff may implement a one in/one out policy for nonmembers during peak times. Experience the Waterpark after hours with the Young Adult Waterpark Night for ages 18-22 or the Monon Mixer for adults. Don’t forget to pack sunscreen, goggles and any other pool must-haves. The Waterpark at the Monon Community Center will be open the following dates and times during the 2018 season. May 26 – Aug. 13 / Every day, 11 a.m. – 7 p.m.
Aug. 14 – Sept. 3 / Saturday and Sunday only, 11 a.m. – 6 p.m.
Labor Day / 11 a.m. – 6 p.m. The Waterpark is included with membership. Prices for day passes for nonmembers are below and can be purchased on-site or at carmelclayparks.com. To get inspired for your Hamilton County getaway, be sure to follow us on Facebook, Twitter and Instagram and sign up for our email newsletter.